He was 46 years old. A well-known, well-respected religious figure in our community. A man blessed with a love of the Quran – no doubt instilled into him by his father and the Quran-centric environment he had growing up. He was a hafidth, renowned qari, and teacher of Quran. 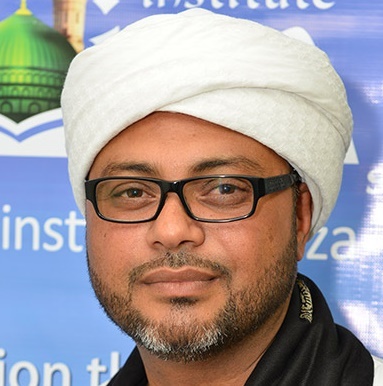 He had established an Islamic school – incorporating a hafidth academy, taught many, many courses both locally and internationally, and had more recently taken on a leadership role in an esteemed multi-national religious institute. His name was Shaykh Abd al-Rasheed Brown, and a few days ago, he left us – departing to Allah’s mercy after suffering complications from a heart operation. The janazah was packed to the brim, bearing testament to the impact this man had had on hundreds, if not thousands of individuals over the course of his life. Tributes poured in for him in the media, and his family, students, friends, and colleagues all mourned his loss – with special programmes set up to perform good deeds on his behalf, to insha-Allah benefit him in the barzakh. I had first encountered him early in my own spiritual transformation. At the time, he was giving the post-taraweeh lectures at my masjid, and I had never before been so inspired and moved by an imam. Maybe it was because I was at the start of my spiritual journey. Or maybe it was because he was so different to the other imams I’d heard my whole life. Imams, primarily, from a certain cultural group whose focus and style had never really touched my heart in a meaningful way – though their messages had been good. This man, however, stood out among them all. He was much younger – in his mid-30s at the time – and his words were infused with passion, knowledge, and vision. When I got married, he happened to be the imam in the masjid near us. And what he did there was truly incredible. His work at that masjid – the level of activity – made it come alive, in a way I’ve never known any other masjid to be since. His school was based there, and the adult education arm of that was also run there – with frequent night classes. He would teach tafseer, mostly, but also taught a very lengthy but extremely inspiring and beneficial seerah class. My wife and I loved his tafseer classes. He always stressed how timeless the Quran is. Times change, but people – the nature of man – remains the same. And so, though the context and environment may be different, the lessons and principles of the Quran are eternal and will always be the best of guidance for humanity. In his classes, he often sprinkled in lessons from his own life. One particular theme which he put across was overcoming adversity. Hardship, he said, is a school that teaches us endurance. As for actual school, he didn’t do very well. He struggled a lot. That admission came as a huge shock to me – given the level of education he later achieved, and the intellectual demeanour he carried with him in general. As he told us once, your attitude – not your aptitude – is the most important thing. You must strive to have the right attitude. Another point was that he used to stutter badly. Again, a shock if you knew the eloquence with which he spoke later in life. But he fought to overcome that, and used positive, verbal reinforcement to help him build his self-confidence. I also got the chance to attend other courses he taught – including tajweed, which is so critical an element of the deen, yet often overlooked when we grow up and think that we already know how to read Quran (even though we may have learnt incorrect pronunciation – a legacy of generations before who just kept teaching the same way they were taught). Ramadans at this masjid were something really special. Aside from his nightly naseehahs, there would be weekend programmes, early morning tafseers, tahajjud programmes and more. I appreciated how the khattam of the Quran was always held off until the 29th night – unlike most other masjids, where they finish on the 27th and the attendance and intensity rapidly declines thereafter. I would also look forward to Sunday nights, when – after Maghrib – he would give a short naseehah to the congregation gathered there. A look back at the week that had passed, and some words of advice for the week to come. It was during one of those talks that he told us of his impending marriage. He’d been divorced at a young age, and had lived alone – actually, near us. He was a neighbour, so we would see him often and saw the normal, non-official side of him. As Muslims, we often only see our ulama at the masjid, or at official religious events. We rarely think of them as ordinary people – who go shopping, relax at home, and lead normal lives. So it was good to experience a different side of one such person. Anyway, so his wife – who also had kids from a previous marriage (he had kids of his own from his first marriage too) – was a student in one of his classes. She had proposed to him after a charity walk, and he accepted. We were so happy for him. In one particular conversation with him, I’d felt the pain he had experienced from being divorced. He had 2 teenage kids, who would sometimes come stay with him at home, yet his life was lived alone – which could not have been easy at all. His has re-married just a few years after our marriage, and he and his wife lived in our complex – a few blocks away. Children soon arrived for them – a son first, who his wife would bring to classes on weeknights; followed by a baby girl not long after. Now, I imagine all the dreams he had for them. The ambitions. How he would have wanted them, too, to be people of the Quran. To be hafidth. To live the deen. To grow up to be of exemplary character – leaders in their community – and always helping and benefiting others, as he himself had done. And now, they have to grow up without a father. Without that tremendous, guiding force which is so critical in youth especially. But they are in good company. As he had pointed out in the seerah class, the best of all creation was also orphaned. And it was Allah Who took care of and raised him (obviously through other people…but essentially, he lost those nearest to him in his youth). A few years later, he left his position as imam of the masjid. He moved his school elsewhere, and moved to a new home. We hardly saw him again after that, but heard about his activities: he had moved onto a more spiritual path, taking up leadership at the local chapter of Shaykh Ninowy’s Madinah Institute. Though our time with him came to an end quite a while ago, the impact he made on us was significant. He was our imam for the important early years of our marriage, and we took valuable counsel from him on private matters that we – the un-learned and inexperienced – needed guidance on. We learnt so much from him. He played a crucial role in our lives in a phase where we were both still changing, growing, learning. Becoming better people. Leaving behind our days of ignorance and striving to walk the path of Islam. Though 46 seems a young age to leave this world, the reality is that his time was always decreed. It’s just that Allah alone knew….and none of us knew. People have a purpose in life, and in his years of being a teacher, imam, leader – he achieved so, so much. Much more than most of us will, and thus we can never say that his passing was untimely – or his life was ‘cut short’. He inspired so many of us. Touched so many hearts. Taught so many minds. Influenced so many lives. And he leaves, in this world, a tremendous legacy. A legacy which, I hope, will be continued by all those who were blessed to have encountered him and learnt from him. May Allah make that legacy continue, spread, and multiply – so that the knowledge he left behind with others, and the goodness that remains in this dunya of him – becomes the greatest sadaqah jariah for him. And may Allah grant his family and loved ones the most beautiful of sabr, and the steadfastness to continue in this world in the best possible way, and make him proud by the way they live their lives. My earliest memory of him goes back to when I was a cranky 4-year old at my 4th birthday party; I remember him amusing me by wearing a party hat on his head and on his face. Fast forward many years and one of my best Ramadhāns was when he was the imaam at Masjidus Sunni. I also appreciated how the khatm was held off until the 29th night.